Adds a non-playable race long time gone called the Orionites. Their abandoned homeworld of Orion has a planetary quality that is out of this world. However, it is guarded by a Huge class vessel called 'The Guardian'. Are you ready to conquer Orion? Adds a non-playable race long time gone called the Orionites. Their abandoned homeworld of Orion has a planetary quality that is out of this world. However, it is guarded by a Huge class vessel called 'The Guardian'. 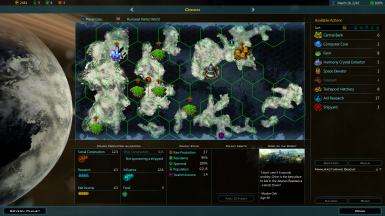 The civilization that acquires the planet also gains a few Ascension tier technologies. 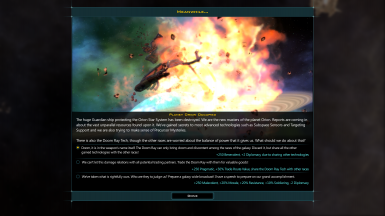 This is a Mini-Mod as it does not contain any other Master of Orion races. 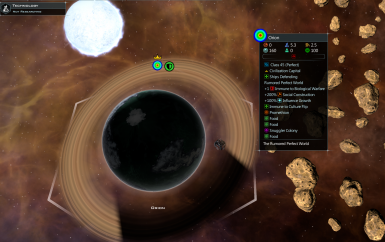 To enable the mod, you must add the faction 'Guardian of Orion' as an opponent. Raising the level of difficulty on the faction above 'Normal' only changes the strength of the Guardian. This mod, of course, is a tribute to 4X Master of Orion video game series. Are you ready to conquer Orion?